This is the easiest tart recipe ever! It is a no-bake tart and even kids can easily make it! After making Blueberry Marmalade, I still had some berries left and I wanted to make something that shows the amazing color of these berries. I had several options from muffins to crumbles, but I wanted to go with the easy one and decided to make this tart. I always used dark chocolate for tart or cakes, but it wouldn’t be a good choice since blueberries wouldn’t be noticeable on such a dark color. There must be a contrast between colors, so I decided to make it with white chocolate and it turned out to be a perfect feast both for your eyes and for your taste! It was the first time I melted white chocolate and I realized that the difference between white chocolate and dark chocolate is not just their colors. White chocolate is more sticky and thicker when melted. Also, it took longer for melted wqhite chocolate on tarts to get stiff when chilled. I wanted it to remain a little creamy, so I didn’t keep it in refrigerator that long. This white chocolate tart with blueberries and pomegranates is a great treat when you have limited energy to prepare something for guests. You don’t need to worry about the baking process, you should just have enough patience to wait. I love these fruits on it, but you can top it with any fruit you like. I had a few blackberries left, so I placed only one in the middle of each tart. I mixed store bought cocoa crackers(biscuits) and melted butter for the crust and chilled it for an hour. We mostly use oatmeal crackers for such no-bake tarts, but I still wanted to have that bitterish flavor of cocoa, so I used cocoa crackers. It also makes a nice dark brown crust which is against the ivory topping. This white chocolate tart is much sweeter than the regular dark chocolate tart, so it would be better to use sourish fruits on the top to compliment its sweetness. That’s why I used blueberries and pomegranates. 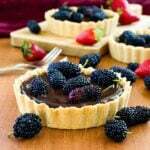 I recommend you to choose sourish fruits on this tart if you don’t want it too sweet. The final result is a yummy white chocolate tart with well balanced flavors of sweet white chocolate, bitterish cocoa and sourish fruits. If you want the topping stiffer, use less cream or just leave it out and chill your tart at least 5 hours. No bake white chocolate tarts with blueberries and pomegranates. Mix crumbled cocoa crackers and melted butter until smooth. Brush tart pans with little butter and share the crust dough into them, chill for an hour. Melt white chocolate in a pot over boiling water. Add in cream and bring to room temperature. Pour it over chilled tart crusts. Share pomegranate seeds and blueberries evenly on tarts and place a blackberry in the middle of each. Chill it for 3 hours for a creamy texture, 5 hours or longer for a stiffer texture. This recipe looks and sounds amazing! I love chocolate and this recipe has plenty of it. I’m adding it to my baking list, can’t wait to try it and share with family. Thanks for the great recipe!! Zerrin, that melted chocolate looks amazing! Do you already have pomegranates at the grocery stores? I don’t see any yet here. 🙂 I love them!